Pacifico won the match 3-2 and knocked out Estudiantes from the cup competition in a major upset.The players were received like heroes in the small western town of General Alvear when they returned from Buenos Aires, where the match was played. 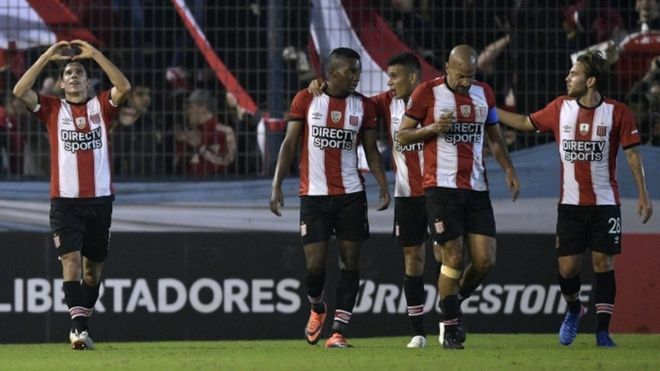 'He must hate me'But the good atmosphere soon turned into bad news.Allende gave Cordoba's Vorterix Radio an interview on Tuesday in which he said "you need to play dirty" to beat big clubs like Estudiantes de La Plata. "We knew that we had to play dirty against them and I kept piercing the Estudiantes strikers with a needle," added the Pacifico defender. "We know that top division players don't like contact, they don't like if we waste time or if we play dirty. So that was the way to do. Football is like that. Football is for the clever," Allende told Vorterix Radio.Colombian striker Juan Otero said Allende jabbed him many times with a needle and that he complained to the referee during the match. "I completely nullified Otero. He must hate me," Allende said on the radio.After hearing the interview, Otero described Allende as "as a nasty man".